Autobot Rewind remembers everything. This makes him an excellent spy, though data overload often causes crushing headaches. Luckily, Sunder is there, to soothe his friend's aching circuits with the gentle thunder of the dubstep beats he loves. I wasn't all that impressed with the Decepticon data discs that I picked up a few months back, but in spite of that I've bought one of the Autobot two-packs containing the exact same molds. Why would I do that? For one reason and one reason only: I'm enamoured of the characters. And since I reviewed the Ratbat/Frenzy set as well as Soundblaster, I figured I might as well give these guys the same treatment. The "data disc" assortment consists of characters who transformed into cassette tapes in the 1980s line (Er...except for Sunder. More on him later. ), meant to go with new versions of the "tape player" Transformers Soundwave, Blaster and Soundblaster. The discs can store in the chests of their players, launch out and auto-transform, a neat revival of one of the line's oldest gimmicks. The actual execution of that gimmick is a bit spotty this time around, but it works well enough and I'm sure it'll do as good a job keeping children entertained as the tapes did in the 80s. The particular set we're looking at today is Rewind and Sunder, two characters with very different backgrounds. Rewind is one of Blaster's original four cassette, and has gotten major media exposure for the first time ever in the recent More Than Meets The Eye comic as a central cast member. Sunder, on the other hand, was introduced to the franchise in 2006, at the tail-end of Takara's disturbing child molestation-centred series Kiss Players. In spite of his questionable origins, Sunder's frankly absurd colour scheme and ridiculous bio instantly made him a favourite of mine and he later become a major character in one of the Archive's RPG campaigns. Because of that, there's no way I'd ever be able to turn down a new toy of the character. But considering the scores I gave to Frenzy and Ratbat, I expected to regret it immediately. 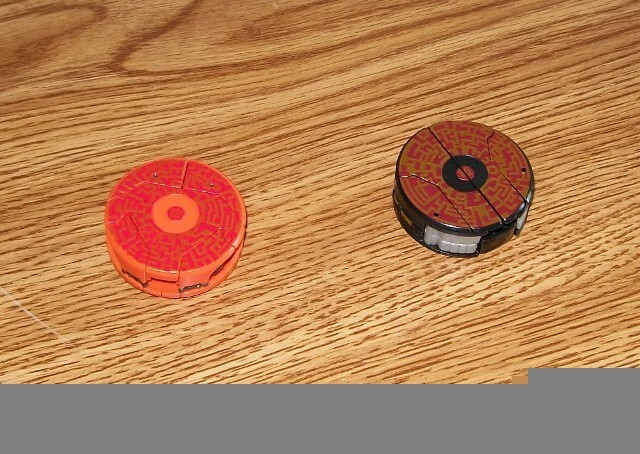 Alternate Mode: Like all the data discs, these two transform into tiny hockey pucks with fancy paint on the top sides. Sunder is orange with a gold pattern painted on him, while Rewind is black with gold and red paint. They really don't bring any play value on their own, other than the fun of watching them auto-transform (which it must be said, works way better for Sunder than it does for Rewind, who needs manual assistance to finish the job). The disc modes aren't meant to be stand-alone, though. They are intended as accessories for the larger "tape-player" robots, and in that capacity they work pretty well. They'll store inside Blaster's chest (or Soundwave/Soundblaster's, but as Autobots they're nominally Blaster's crew), then launch out and auto-transform when they hit the ground. In that capacity the alt-modes do exactly what they're meant to do, but on their own they're really quite boring. 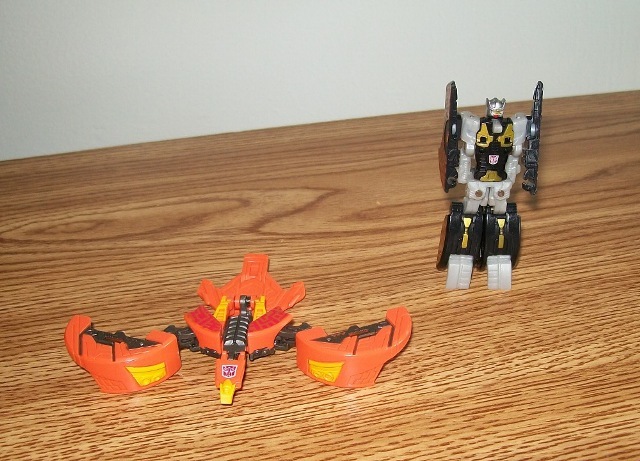 Robot Mode: Sunder is a mostly orange condor, with some charcoal grey and yellow serving as highlights and a red Autobrand on top of his head. The result is very striking, and Sunder ranks up with Ratbat as the most visually interesting of the data discs in my opinion. Rewind is a lot less bright, relying on a classy black and grey scheme with gold details, a red face, and an Autobot symbol on his stomach. He's the polar opposite of Sunder looks-wise, and the two make a very good pair (don't tell Chromedome...). It should be noted that while the bird mode replicates the proportions of the old condor tape pretty well all things considered, Rewind's layout is very, very different to the Rewind of G1. While the original figure was blocky and short, Generations Rewind is proportionally tall and slender. Because of that it's miraculous that he looks as much like Rewind as he does, but the deco artist did a very good job capturing the key points of his look on a very different canvas than it was meant for. The figures' robot modes are pretty simple, since they're tiny and rely on spring-loaded transformations. Sunder's wings, head and tail are articulated, but pop back to their default location as soon as you let go of him. Rewind is a tiny bit better off -- his knees, hips, waist and one set of shoulder joints are spring-loaded, but you can at least swing his arms up and down freely. Suffice it to say, neither one is going to be capable of a wide range of dynamic poses, but they're decent fun to fiddle around with.